Slow Cooked Shoulder of Lamb with Rosemary Scented Shallots. ** Ask your butcher to take out the bone of the shoulder but give it to you to use in the pan when roasting the shoulder to help make the gravy. Add the tomato puree and flour to the cooking tray and place back on the stove to cook slightly. Then add the stock and bring to the boil. Strain through a very fine sieve into a clean pan and bring back to the boil, season if required. Carve the lamb onto a warm serving dish, place the shallots around and put the gravy in to a sauce boat. Serve with green vegetables and some potatoes. There’s nothing better than a delicious roast chicken dinner, it’s a real crowd-pleaser. 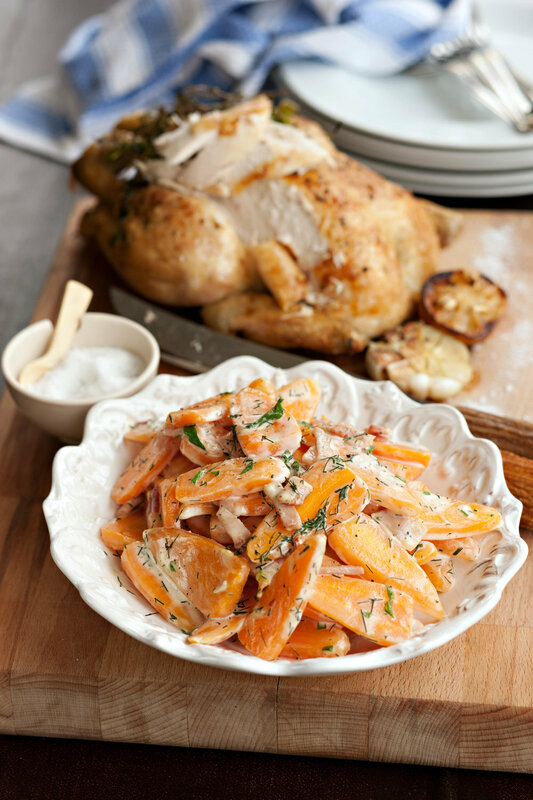 Served with creamy, lemony Chantenay carrots what could be better?! This vibrant green and pink side dish has a delicious flavour that'll keep you coming back for more. The perfect accompaniment to a hearty roast. Heat the olive oil in a large frying pan and add the sliced garlic, halved radishes, chopped kale and thyme leaves. Toss in the pan for 5-7 minutes until the kale is toasty at the edges and the radishes have softened slightly. Season to taste.